Remember that blue beauty, the first diver watch with mechanically produced light from De Bethune? It’s the De Bethune DB28GS Grand Bleu. Now you can enjoy it in Qatar. Qatar Show, building on the successful legacy of the fabled Doha Jewellery & Watches Exhibition, will be the setting for De Bethune to meet with connoisseurs of contemporary Fine Watchmaking in the Middle East. Held from February 20th to 25th, this will be the inaugural edition of Qatar Show, continuing an annual tradition that began with the first Doha Jewellery & Watches Exhibition sixteen years ago. The exclusive event, designed for lovers and collectors of Fine Watchmaking, and independent manufacturers in particular, has become a must on the international watchmaking calendar. De Bethune is present in Doha with an exhibition area for its iconic timepieces and its latest 2019 models, including the DB25 Starry Varius Chronomètre Tourbillon, which was awarded “Best Chronometer of the Year” at the last Grand Prix d’Horlogerie de Genève, as well as the latest DB28GS Grand Bleu, which was unveiled earlier this year in Geneva. 2019: De Bethune presents its first 100% sports watch. This new chapter begins with a technical and elegant diver’s model. Integrating creativity! Driving innovation! Veering firmly off the beaten track! Not repeating, but instead inventing; pursuing ingenious reflection while improving precision, reliability, readability and comfort: the DB28GS Grand Bleu was designed and developed to be a resolutely sporty watch, adapted to the active life of today’s men, while cultivating the aesthetic elegance cherished by De Bethune. A new calibre; water resistance to more than 100 metres; excellent readability including in the darkest depths thanks to ingenious lighting inside the movement; a different bezel that rotates this time with the crystal to indicate dive times; a titanium case for a light feel and a rubber strap for convenience; along with a five-day power reserve. The model is delivered with two straps: a canvas version and a striated natural rubber iteration with titanium folding clasp, which also contributes to the practical and pleasant wearer comfort of this timepiece. 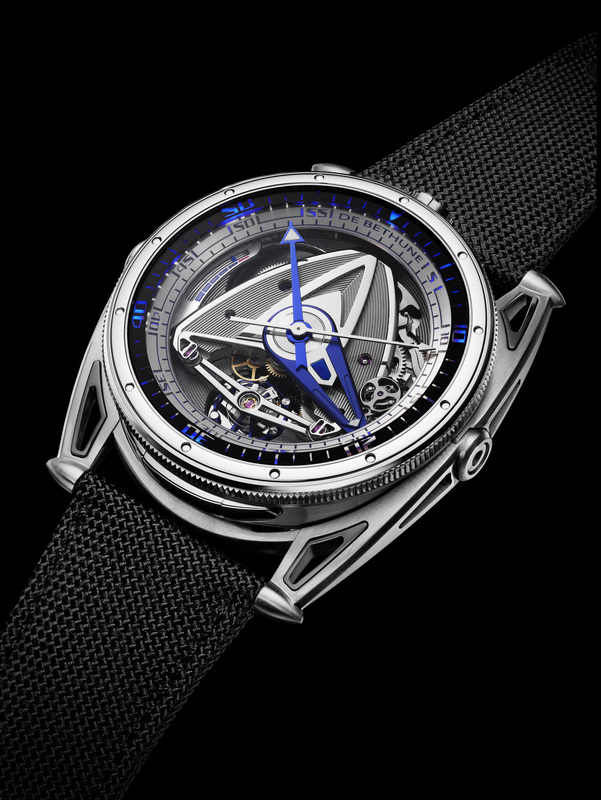 For more information, please visit the De Bethune Website.